I’d like to talk about a new feature that ArenaNet recently announced would be implemented with the beginning of season 2 of the Living Story. 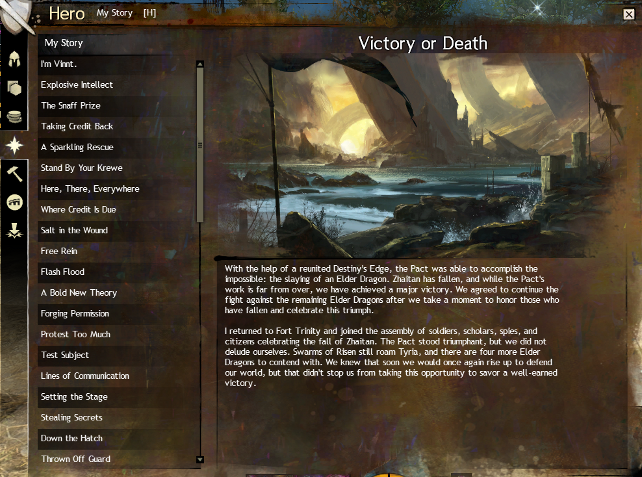 The new Story Journal feature is one that has come about as a result of feedback from players who experienced season 1. One of the biggest and most prominent complaints about the Living Story was the temporary nature of the releases. Players had only two weeks in which to experience the story content of each release. This was because of the objective of the initiative to create an ever-changing game world so naturally when the next part of the story came along, the previous part left. There were permanent effects such as the change to Kessex Hills and the destruction of Lion’s Arch, however the story content would disappear and move on. This generated a considerable amount of displeasure throughout the year as players who missed one release couldn’t goo back and catch up with it; similarly, new players to the game would have little to no idea on what was happening in Tyria. Perhaps the most requested feature for the game since the inception of the Living Story has been the desire for a method of replaying previous releases so as not to miss out on the story. To answer this request the developers will introduce an upgrade to the Story Journal. Currently the story journal is a tab on your hero panel that serves as a record of your Personal Story. It tracks the missions you have completed and contains a small blurb about each one but has no other functionality. The story journal as it is now. When season 2 of the Living Story goes live, the new and improved story journal will be implemented alongside. With the new feature players will be able to play the content whenever they want to. 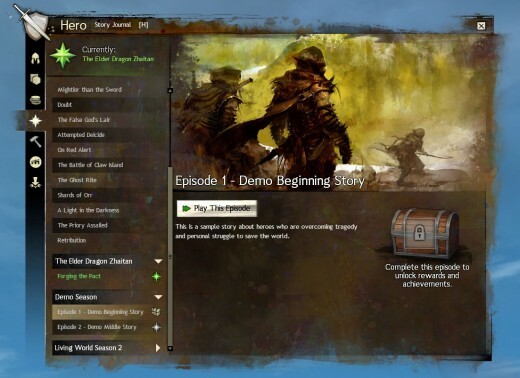 Each new release will become a new ‘episode’ or entry in the story journal and the player can open the journal, select their desired episode and activate it. The journal will then direct the player to the associated story instance which they can enter and experience like any other. This means you will also be able to replay your favourite releases and in doing so you can work towards additional achievements that are unlocked after your initial playthrough. This new achievement model will replace the current meta-achievement archetype for the Living Story releases. Each individual achievement will have it’s own reward and developers have said that they will be harder than standard achievements. The story journal as it will be starting July 1st. Although the Living World will still follow the two-week release schedule you no longer have to complete the release within that time-frame. As long as you log in at some point during a release, it will be permanently unlocked on your account allowing you to play it at your leisure. If you miss a release, you will be able to permanently unlock it for a one-time cost of 200 gems. Initially, only season 2 episodes will be re-playable through the journal; personal story and season 1 will not be available. You can read the blog post from ANet about the journal here and watch a recording of a developer livestream regarding it here. Season 2 of the Living Story will begin on July 1st, 2014. I’ll see you again when we have more information on it.